They may have been unable to replicate in Russian national competitions the successes they had in Soviet times, but even so, there is no doubt that Dynamo Moscow belong to the country's all-time football elite. Along with their traditional archrivals Spartak they dominated the Soviet football in its first three decades, while in 1972 they became the first Russian team to reach a UEFA competition final. Dynamo's old stadium and historic home, before its demolition in 2011. Dynamo (or Dinamo ... "Dy" in Russian and Ukrainian sounds different to "Di" in Serbo-Croatian or Georgian, it is a purely accent/orthography thing) has a prehistory that goes back to the 1890s when the British introduced football in St. Petersburg and Moscow. The Englishman Harry Charnock would establish a club that later would be Dynamo Moscow. This historical background has also the answer to the teams blue color; Charnock was from Blackburn, and therefore he choose the colors of Blackburn Rovers. Football Club Dynamo Moscow were founded in 1923, and for decades they used to be closely associated with the Soviet Union's secret police, something very common in that time, as most major clubs had a powerful sponsor. They were Soviet Union's first champions in 1936. Their main competitors, Spartak Moscow, won the autumn Championship that year, but Dynamo had already made history by winning the title in the spring season. Next year they repeated their success and they went a step further by winning the Soviet Cup as well. Dynamo won the last Championship before the Soviet Union got involved in World War II, and they were again first when the competition restarted in 1945. Before the forties were over, they had won a fifth Championship title, while the rest of the seasons they finished second, behind Spartak Moscow. It was in those years that the games between Moscow's top teams at the time started being considered the most important matches of every season in the whole Soviet Union. The forties were also the time that Sergei Solovyov shined, Dynamo's all-time leading scorer. He joined the club in 1940, and despite the fact that there were no football competitions in the country during World War II, he still managed to end his career in 1952 having scored 135 goals (127 of which in the Championship), a number no one has come even close to surpassing ever since. When Solovyov retired, Dynamo had already found their next player-symbol, only... they didn't know it yet. Legendary Lev Yashin, who is considered by many even today to be the best goalkeeper in the history of the sport, had made his debut in 1950, but it had been an unfortunate one, he only played twice that season, and had to wait until 1953 to be given a second chance. Once that happened, the “Black Spider” (he always played dressed in black, from head to toes) never looked back. Yashin spent his entire career at Dynamo. When he retired in 1970, he had led the team to five more Championship titles (four of those in the second half of the fifties), three Soviet Cup triumphs, while in five other seasons Dynamo had touched the “Class A” (that is how the Soviet Championship was called back then) title, but had finished second, usually behind Spartak. Ironically, Dynamo had their best season in a UEFA competition almost right after Yashin retired. In 1972 they reached the final of the Cup Winners' Cup, becoming the first Russian club to go that far. They lost the final to Glasgow Rangers in Barcelona, in what was the closest they ever got to winning an international title. In 1978 and 1985 they reached the semifinals of the same competition, but interestingly they got eliminated both times by Vienna clubs, first Austria, and then Rapid. They had earned the right to compete in the Cup Winners' Cup those two seasons, having won the Soviet Cup in 1977 and 1984. As for the Championship, they had won it one last time in 1976, but it was clear that the era of their dominance had come to an end. Member of the team that won those three titles was Aleksandr Novikov, a defender who left Dynamo in 1987 having served them for 13 years, and played a total of 395 games, more than anyone else in Dynamo's history. Ever since the dissolution of the USSR, Dynamo have won just one title, the Russian Cup in 1995. During the nineties they remained competitive, usually finishing in the Top 5 and making it to at least the semifinals of the Cup. The 21st century though has been tough for them. In 2009, when VTB Bank took over, it looked as if Dynamo had found the strong backer they needed to compete against other big clubs and start winning titles again. Big names from abroad were brought in, but things went bad, the club ended up with a huge debt, and, sadly for everyone associated with the team, the end of the 2015-16 season found them being relegated for the first time in their history. Dynamo had always competed at the top level since the inaugural season of the Soviet Championship in 1936. Exactly eighty years later, they reached rock bottom. As someone would expect from a truly big club, Dynamo managed to pick their pieces up right away, and after a year in the second division they returned to the Premier League. 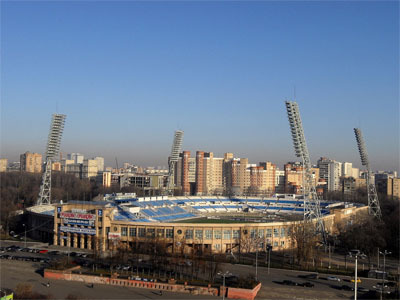 More good news followed up soon, as they entered their impressive new stadium, having spent years at Khimki Arena, after their traditional home, the Dynamo Stadium, was closed down in 2008 for demolition. Historically, Dynamo's logo included the word “MOCKBA” covering half a football, right below a big “D” in a traditional cursive style. In the latest logo, “D” has stayed untouched, but the name of the city is gone, just as the ball and the rhombus that all these used to be included in. (There is a list of Dinamos/Dynamos in various countries. All of them had the same cursive “D” as part of their logo or as the only thing on their logo, until some, after the fall of the Soviet Union, decided to switch. Some others, like Dinamo Tbilisi in Georgia, have kept the “D”, but have modernized it.) Each one of the two stars stands for five Championship titles won. 1923 The club is established. 1928 The club move to the Central Dynamo Stadium. 1936 First time Soviet national league champions. 1937 Winning their first Soviet Cup title. 2009 The club move to the Arena Khimki.